There’s something inherently beautiful about seeing someone catch their stride. 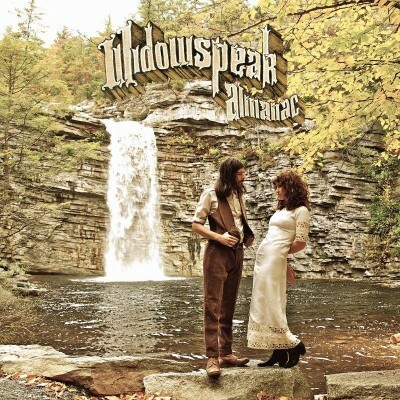 As a group, Widowspeak did their fair share of stumbling on their self-titled 2011 debut. If you missed it, don’t feel too bad. It was unobtrusive, comprised mostly of Suburu-commercial indie pop that didn’t give much but didn’t ask much in return. In essence, it took the '60s girl-group sound and stuck it in a cave. It was three parts dull, one part promise. Most of all, it was oh-so-Brooklyn, reflecting the echo-prone, flavorless trends of New York's grandest borough. On their second attempt, Almanac, Widowspeak have wizened up and brought it all back home. On their debut, the band were essentially asking themselves: “Can we play music?” With that question answered (in the affirmative, no less), Almanac left them free to broaden their scope. The cover of the album puts guitarist Robert Earle Thomas and singer Molly Hamilton in turn-of-the-century period garb, swooning at one another before a glistening waterfall you won’t find on any New York sidestreet. Like so many Brooklynite bands, these guys are pilgrims, just hiding out in the eternal cultural funnel while they get their feet under them. Their home is Tacoma, Washington, an urban center at the foot of the gargantuan Mount Rainier, a volcano monstrous enough to make any skyscraper feel inadequate. It’s there, in nature’s shadow, far removed from the slopped-up studio apartments they call home, that the new record is set. The components are the same. Like its predecessor, it’s dream-pop in the way of Beach House. Sunset-on-the-sand guitars and vocals that sound like they were carried here on a recent warm front. Hamilton doesn’t quite evoke the same mystical presence as Victoria Legrand, but she’s doing better. In fact, the whole band’s experienced a galactic leap in confidence. Thomas follows through on whispered hints of ingenuity, experimenting with discord and harmonic mathematics in ways that, if not innovative, are at least exciting and fresh. Tracks like “Devil Knows” show the group slowly mastering of their genre’s greatest tool: texture. Delicate ladders of filtered guitar delay and arpeggios wash over the mix and make a highlight out of a potential throwaway. It’s not all about the reverb anymore. The pastoral imagery is clear and pervasive, but this is no hipster camping trip. It’s a celebration of nature and the untapped frontier, as much as an exploration of the past. The whole thing sounds like it was pulled out of that dusty old chest in your attic that you’ve never opened, less out of reverence than lack of interest. The contents within can be captivating. Clanging, chiming music boxes are suffocated deep below the witch-trial waltz of “Thick As Thieves.” The beautiful “Minnewaska” is a spiritual-type exaltation of the lake of the same name, and, fear not, it will get you swaying. There’s definite maturation here. “Ballad of the Golden Hour” breaks new ground for Widowspeak simply by transforming, breaking out of the A.B.A.B formula that’s, up till this point, dominated everything they’ve touched. It all comes to a head on the apocalyptic album closer “Storm King.” an arcane, droning chant that compiles all of the groups greatest strengths into a single, sparkling suckerpunch. The tension is almost unending, modal, fuzzy guitar spindles cracking against breathy, cryptic vocals. If this is the way Widowspeak are headed in the future, I'm along for the ride. Almanac is not quite a great record, but it is very good. The band is swimming in a harsh tide of likeminded acts. Making a real mark isn’t going to be easy, but this is an excellent first step. They could have stagnated, but instead they chose to evolve, however slowly, into something better. That’s artistic ambition manifest, and it ought to be praised.